I hope you had a wonderful Christmas and found lots of new stash waiting for you under the tree? As I've had a few days of leave, I've already been playing with my new stamps in between eating too much chocolate :). 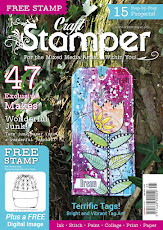 February issue of Craft Stamper is officially on sale 1st January. Of course the shops are shut as it's a bank holiday, but it should be available as soon as they are open again. I know many subscribers have the new magazine already. Lots of lovely projects to tempt you as usual, including an Image Transfer masterclass which we have been asked for many times. The free stamp this month has been designed by Glenda Waterworth and is a gorgeous bird and heart image. A very Happy New Year readers. Sharpie giveaway winners will be drawn after I am back in the office on 4th January. 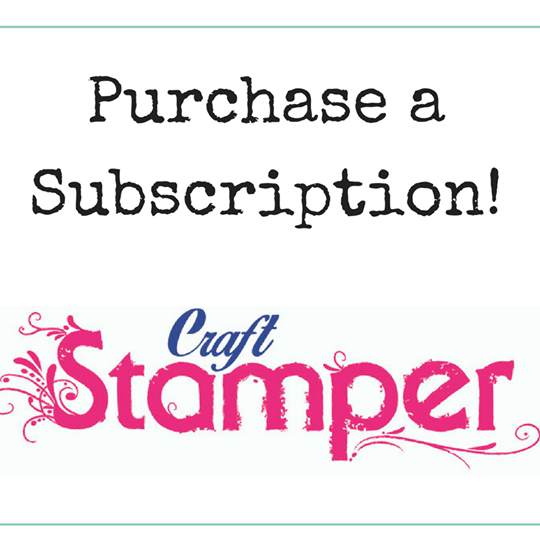 Best wishes of the season to all our readers from the Craft Stamper team. 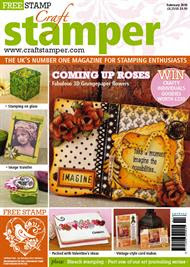 Thank you for your loyalty to our little magazine - we hope you will continue to enjoy Craft Stamper in 2010. We have some little changes coming next year to keep the magazine looking fresh, with two brand new features starting in the April issue. We are also still looking for reader submissions so if you think you've created something our readers will love please do get in touch. We'd love to hear from you. Have a wonderful, relaxing and fun Christmas. I hope Santa brings you lots of lovely stash to enjoy! See you in 2010. PS - Our fantastic Sharpie giveaway (scroll down two posts) is still running until 30th December so leave a comment for your chance to win one of these amazing prizes. 12 new Distress Ink colours - yippeeeeeeeeeee! And Sizzix dies by Sir Tim - I can't wait for these, I lurve my Big Shot to pieces and have been waiting for some 'must have' new dies. Massive Sharpie Blog Candy Giveaway worth £350! I am delighted to be able to reveal that Craft Stamper have teamed up with Sharpie to give 10 lucky readers the chance to get their hands on a goodie bag stuffed with fabulous Sharpie markers - worth £35 each! I personally love my Sharpie markers (I have quite a few!) and am rather envious that I’m not allowed to enter!!! Sharpies are great for crafters as they will write on just about anything. Try using them for your Christmas makes this year – have a go at doodling with them on acetate and acrylic, use the fine markers for journaling your scrapbook pages or art journals, or use them to add faux stitching to your cards in an array of colours! With Christmas just around the corner, we are already feeling the festive spirit; decorating our homes and wrapping up presents. Why not use a Sharpie marker to ensure your present stands out from the rest whilst under the tree; whether personalising your wrapping paper with a festive silver snowflake or putting colourful finishing touches to that perfect tag? Sharpie markers are available in 13 stand-out colours making them the ideal Christmas creative companion. For your chance to win this fabulous prize just leave a blog comment before midnight (GMT) 30th December and if possible link back to this candy from your blog to spread the word. Who knows, you might get a fabulous Sharpie goodie bag to help write away the New Year blues! Big thank you to Sharpie for offering our readers this special Christmas present! Here's another Christmas card that I would like to share with you. I've already mentioned step cards, but I have also noticed that hinge cards are popular at the moment. Again I'd never made one before, so I thought I should give it a go! Actually this uses a card that I had messed up....I covered my mistake using the papers, so my card didn't go to waste! The card is really easy to make, you just have to fold the front in half and then use a brad to hold it in place, it's then up to you how you decorate it. For my card I used papers from the Artylicious Season's Greetings CD Rom edged in gold Krylon pen. I cut out a square of heavy duty acetate and ran this through my Wizard in the snowflake Cuttlebug Embossing Folder. I wrapped a gold ribbon around the acetate and then fixed the acetate to the card using little gold brads. I stamped the Winter tree (Elusive Images, Winter tree from the Winter Tree and Torn Holly Script Themeplate) in Cranberry Adirondack Ink onto patterned paper. This was then cut out edged with Krylon and matted onto red pearlised card before attaching to the acetate. As a finishing touch, a little bit of gold glitter was added to the branches. On a bit of a roll with the Christmas cards now so I'm sharing another card with you today. 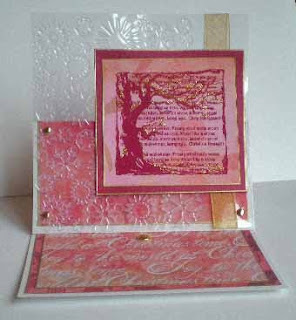 This card is loosely based on a sketch challenge from an old Craft Stamper. I used two co-ordinating sheets of paper from the Artylicious Season's Greetings CD Rom to form the back ground for this card. The Gorjuss Guardian Angel was stamped in black Impress onto smooth white card and then coloured using Copic markers. I covered the wings and heart pendent in Glossy Accents and then sprinkled them with fine holographic glitter. 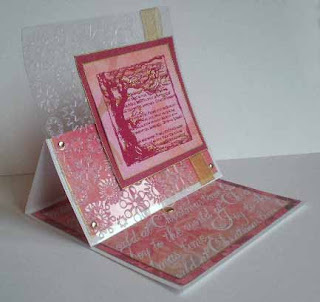 The flourishes are cut from grey pearlised card using a Spellbinders die. The flowers were punched out of white card these were embossed in the snowflake Cuttlebug embossing folder and then distressed with Colorbox Chalk Inks, the tag was made in the same way...just remember to stamp the sentiment first! As promised earlier I am sharing another of my Christmas cards with you. I've noticed recently that step cards and side step cards seem to be quite popular out there in blog land. I've never made a side step card before so I thought I would try it out. I started with a 13.5cm x 13.5cm (5 1/4" x 5 1/4") card as my base and worked out my score/cutting lines from there. 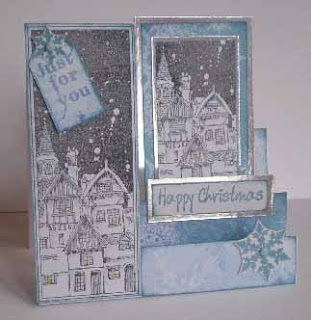 The card was covered using papers from Artylicious Season's Greetings CD Rom. I used the house stamp from Elusive Images, Snow is Falling Rubber Stamp Themeplate and stamped this twice onto smooth white card using Archival Black ink. The images were then coloured with Copic Markers. These were matted and layered with Artylicious papers and Silver card. The snowflakes from JudiKins, Sentiment and tag (Craft Stamper free stamp, November Issue) were all stamped using Colorbox Chalk inks. The card was assembled as per the picture and then Glossy Accents and fine holographic glitter were added to give the finishing touch. Why not try this out for yourselves! New issue and congratulations Susan! The new issue is out tomorrow, Friday 4th December (well officially anyway, although I know some of the shops have it already). For the first time, our January issue is not completely Christmas themed, so I hope you will like the change. We toned down the Christmas content as I know a lot of you have made your seasonal creations already - unlike me! 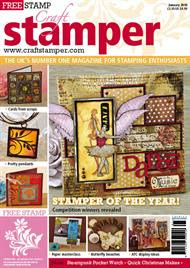 We have also revealed the results of our Stamper of the Year competition 2009. Susan Jenney's was crowned overall winner and for an extra special treat her canvas is featured on our front cover as the main image. Bet that was a shock heh Susan?! Instructions for creating Susan's canvas are here on our website - it's has so much going on we couldn't fit all the text into the mag! Congratulations too to our category winners Clare Earl (best card) and Vicky Fothergill (best non-card creation). I hope you will join me in congratulating Susan, Clare, Vicky and all the finalists. Everyone in the world probably knows already, but a heads-up from me that Tim Holtz's 12 Tags of Christmas starts today over on his blog. If you've never seen this before, Tim creates a different seasonal tag each day for 12 days, using a variety of his products and techniques. Great fun to play along or even just to admire his creativity. Plus there are usually lots of giveaways too.